ACTH (same as Corticotropin) is a 39 amino acid active peptide produced by the anterior pituitary. ACTH is ~5 kDa, and the POMC precursor is ~30 kDa. The molecular weight of POMC depends upon isoform variation and post-translational modifications. ACTH (same as Corticotropin) is a 39 amino acid active peptide produced by the anterior pituitary. This MAb is specific to Synacthen (aa1-24 of ACTH); does not react with CLIP (aa17-39 of ACTH). POMC (pro-opiomelanocortin or corticotropin-lipotropin) is a 267 amino acid polypeptide hormone precursor that goes through extensive, tissue-specific posttranslational processing by convertases. POMC is cleaved into ten hormone chains named NPP, ACTH, alpha-MSH (Melanocyte Stimulating Hormone), beta-MSH, gamma-MSH, CLIP (corticotropin-like intermediary peptide), Lipotropin-beta, Lipotropin-gamma, beta-endorphin and Met-enkephalin. ACTH is also produced by cells of immune system (T-cells, B-cells, and macrophages) in response to stimuli associated with stress. Anti-ACTH is a useful marker in classification of pituitary tumors and the study of pituitary disease. 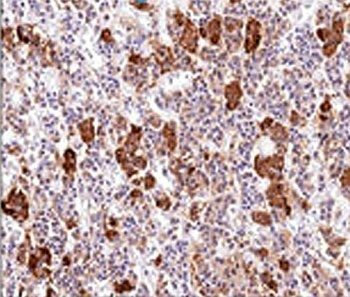 It reacts with ACTH-producing cells (corticotrophs).It also may react with other tumors (e.g. some small cell carcinomas of the lung) causing paraneoplastic syndromes by secreting ACTH. Catalog number key for antibody number 0026, Anti-ACTH (AH26) The prefix indicates conjugation, followed by the antibody number and size suffix.